Yeah, but: Dance with the one that brung ya. The Long Version: Subway stations don't need to accomplish many functions: they connect people to trains, surface transit, and the street. 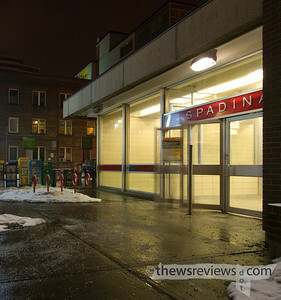 Somehow Spadina station manages to do it all the hard way. The streetcars come right to the mezzanine level, which is unique to this station. It's an unexpected convenience, and when the streetcars are running properly it flows very smoothly. On the other hand, when something goes wrong, it takes only a few minutes for the whole area to clog. This just emphasizes the other unique feature about Spadina station: except for the streetcar, there's nothing much else going on. There is also a bus that runs from Spadina station, still using the surface loop that the Shuffle Demons made famous. It's hard to find, as the exit to the loading area and street is cleverly hidden around the corner and - in rush hour - behind the crowds that are waiting for the streetcar. 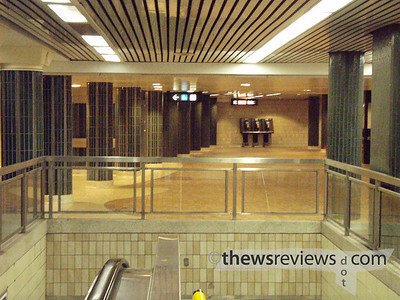 There's a second exit to the street level at the Bloor end, which is at the end of an unpeopled annex concealed behind a row of pillars and an abnormally large ATM enclosure. The ultra-diligent will also find the walkway to the north-south tracks here. Spadina subway station is the least-used transfer point in the Subway/RT network, and for a very good reason: it's much easier to transfer at St. George where the tracks are literally right on top of each other. 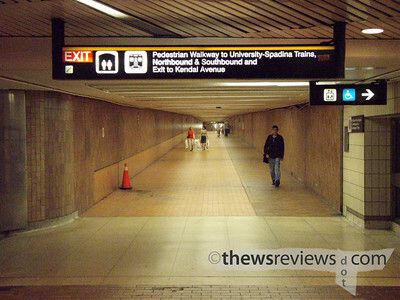 From the University-Spadina line there's another set of exits that are half-way to Dupont station. 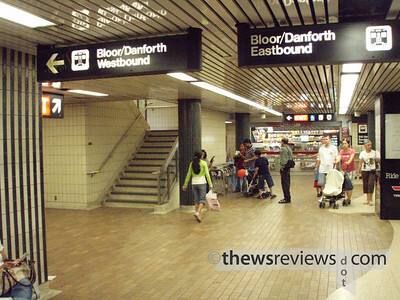 Traveling from these exits to the exits at the far end of the Bloor line's station creates the longest trip you can take on foot after paying a TTC fare. There used to be a moving sidewalk to connect the two distant halves of the station, but it was taken out and tiled over to save some money. It wasn't an unreasonable decision -- hardly anyone uses it, after all -- but I really miss it and docked an Execution point for it.